MetalRockNews: Former Guns N' Roses guitarist DJ Ashba about Axl Rose: "He treated me like gold"
Former Guns N' Roses guitarist DJ Ashba about Axl Rose: "He treated me like gold"
Former Guns N' Roses guitarist DJ Ashba was recently interviewed by SiriusXM, you can read some excerpts below. 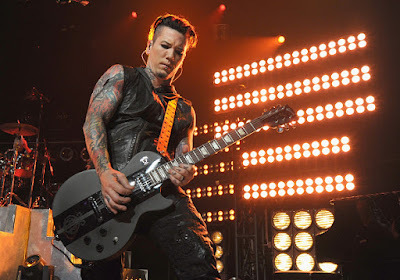 About how difficult it was dealing with Axl Rose on a scale of 1 to "Kanye West," with "Kanye" signifying the most difficult a person can be, Ashba said: "It got difficult here and there. I mean, he's definitely a unique character." He added: "You know what? I had the best time of my life doing it. I'm grateful. But he's the kind of guy that he has a very tight-knit circle, and I was fortunate enough to be a part of that tight-knit circle. And he's always treated me like gold. So, as far as what I can say, I have not a bad word to say. Although I do know if you cross him, he can turn more into the Kanye side of things."